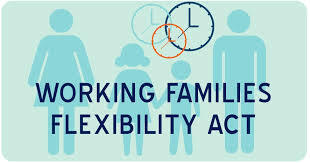 The Working Families Flexibility Act, which would amend the Fair Labor Standards Act (FLSA) to allow private-sector companies to offer employees who are eligible for overtime the choice between being paid in cash for hours they work above 40 or accruing an hour and a half of paid time off, passed the United States House on Tuesday. Bill Sponsor Representative, Martha Roby of Alabama, claims it gives employers and employees flexibility in scheduling, which could increase employee satisfaction and retention. Currently, it is illegal under the FLSA for private employers to pay in comp time. 1) New OT Possibilities: the proposed legislation would enable nonunionized private employers to offer workers the option of accruing up to 160 hours of "comp time" for hours worked beyond 40 in a week. Employees would have to voluntarily agree, in writing, to such an arrangement and would be able to change their mind at any point, cash out their unused time off and return to a cash compensation structure for overtime. Employers can likewise stop offering comp time as an option at any point as long as they give workers 30 days’ notice of the change in policy. If employees’ accrued time goes unused at the end of any given year, companies have about 30 days to reimburse the workers in cash for that time. 4) Interactive Process: The law will create an interactive process between workers and employers that may ultimately leave workers more satisfied with their jobs. Creating clear policies for employees’ requests for paid time off and training management how to comply with laws before legal issues arise is highly advised, if the bill passes the Senate. Common Sense Counsel: I am pleased to report that our local East Alabama Society of Human Resources Managers Chapter (EASHRM) has supported and championed Congressman Roby’s bill for 2 years during our one on one visits with the Alabama Congressional Delegation. If it becomes law, it will be a win-win for private employees and employers alike giving them flexibly, choices and higher satisfaction in the workplace. Stay tuned to see if the United States Senate gets the memo.